Elevation: minimum 792 feet, maximum 1245 feet. Area Habitat: open land 12.74%, forest 87.00%, wetland 0.26%, open water 0.05%. Open under statewide regulations for all squirrel, furbearer, deer and turkey seasons. Bear: Zone 3. See the Black Bear Hunting page on this website for more details. From Flemingsburg, go north on HWY 57 to HWY 3301, take HWY 3301 to HWY 559, turn left toward Wallingford. Two entrances, watch for area signs. 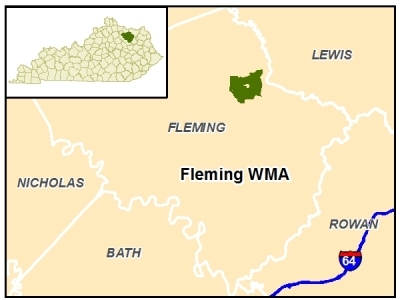 From Flemingsburg, go north on HWY 57 to HWY 3301, then East on CR-1030 (Colgan RD). Alternately, take HWY 559 West from Flemingsburg to Wallingford then North on CR 1032 (Dudley Hollow RD). Oak-hickory woods, some croplands, woodland openings. Opportunities for fishing, hunting, and hiking. Horseback riding trails also.